The average brain weighs about one and a half kilograms and is surrounded and protected by the skull. The brain controls how the body functions. The brain is largely made up of nerve cells, or neurones which communicate with each other and with other parts of the body by sending messages (or nerve impulses, which are actually very small electric currents) through a complex system of nerve pathways. The brain contains four cavities filled with fluid called cerebrospinal fluid. The fluid made in these cavities flows through narrow passages between the cavities and the surface of the brain. Occasionally a brain tumour can block this flow. The fluid dams up in the brain. As more fluid is made, the pressure rises. This is called hydrocephalus and is common in children with brain tumours. A brain tumour is an abnormal growth of tissue contained within the skull, and can be benign# (without cancer cells) or malignant (contains cancer cells). The brain controls vital functions such as memory and learning, the senses (hearing, sight, smell, taste, and touch), and emotion. It also controls other parts of the body, including muscles, organs, and blood vessels. (#Note: The Acoustic Neuroma Association NSW will only be addressing issues relating to benign cranial tumours). Benign brain tumours are usually slow growing, have a fibrous covering (encapsulation) and can cause problems by pressing on and damaging the surrounding brain tissue. They can, however, often be successfully removed by surgery. Malignant brain tumour - some are contained inside a capsule and are easy to remove, while others have thin filaments spreading through the brain. Many malignant brain tumours are secondary cancers, which means they developed from a cancer somewhere else in the body. Where in the Brain do tumours arise? The brain tumours can arise inside the nervous tissue of the brain ("intra-axial" see below) or within the covering of the brain (dura mater or meninges) ("extra-axial but intra-dural"). One implication for this classification is that surgery for intra-axial brain tumours may involve entering and traversing normal brain to reach the brain tumour. For the extra-axial tumours, entry into the brain may not be required to remove the brain tumour. Rather, the brain may be retracted to expose the extra-axial tumour for removal. The intra-axial brain tumours are tumours that grow within the brain tissue itself. These brain tumours usually arise from the astrocytes, neurons or glia (most often the glia). These brain tumours include the glioblastoma multiforme, anaplastic astrocytoma, fibrillary astrocytoma and pilocytic astrocytoma. Other intrinsic brain tumours include the hemangioblastoma, choroid plexus adenoma, pineal region tumours and others. The extra-axial tumours include the tumours of the covering of the brain and include the acoustic neuromas, meningiomas, atypical meningiomas, malignant meningiomas, pituitary tumours (non-secreting, Cushing's disease, growth hormone-secreting, prolactin-secreting) chordomas, chondrosarcomas, and others. Benign brain tumours can arise from the uncontrolled division of cells that normally occupy the brain ("intrinsic" or "primary" brain tumours such as the gliomas, for example, that arise from the normal "glial" cells that are present in the brain). Rare brain tumours can run in families. Neurofibromatosis type 2 is an inherited condition associated with schwannomas of both acoustic (hearing) nerves and in some patients, multiple meningiomas, or spinal cord ependymomas. Patients with tuberous sclerosis may have non-infiltrating subependymal giant cell astrocytomas in addition to benign tumours of the skin, heart, or kidneys. Brain tumours cause "symptoms" by pressing on, or invading normal brain. These symptoms can result from increased pressure on the brain or destruction of normal nervous tissue. Symptoms can include headache (usually worse in the morning), nausea, vomiting, seizure, and weakness or numbness in the arms and/or legs. Headache is a common symptom of brain tumour, occurring in about 50% of patients. None of these symptoms are specific for brain tumours and they all can be caused by other medical problems. Less than 1% of headaches are caused by brain tumours. Brain tumours cause approximately 10% of new seizures in adults. What is childhood cerebellar astrocytoma? Astrocytomas are tumours that develop from brain cells called astrocytes. Childhood cerebellar astrocytoma occur in the area of the brain called the cerebellum, which is located at the back of the brain and controls balance and complex motor activities, including walking and talking. Cerebellar astrocytomas usually grow slowly and do not usually spread from the site in which they originated to other parts of the brain or body, although they can invade large areas. More than 80% of cerebellar astrocytomas are grade 1, localised tumours, cystic tumours, although higher grades of tumour can also occur. It is rare, however, to find malignant forms of these tumours. This rare, benign tumour tends to arise at the base of the skull, especially in the area of the pituitary gland. The malignant form of this tumour is the chondrosarcoma. The chordoma occurs at the base of the skull in about 1 in 3 cases, or at the end of the spine. It is more common in people in their 20s and 30s. It is a benign, slow growing, extradural tumour. This uncommon tumour represents only 0.2% of primary central nervous system tumours. They are usually treated with a combination of surgery and radiation. This is a rare, benign tumour most common in children under the age of 12. About 4% of primary brain tumours in that age group are choroid plexus papillomas. It represents less than 1% of all primary brain tumours. Choroid plexus papillomas grow slowly and eventually block the flow of cerebrospinal fluid. This causes hydrocephalus and increased intracranial pressure. The treatment of choice is surgery. Tumour removal resolves the hydrocephalus in half of the patients. The remaining patients require a shunt in addition to resection. Craniopharyngiomas are brain tumours that usually affect infants and children. Like chordomas, they develop from cells left over from early fetal development. Cranipharyngiomas are often located near the brain's pituitary gland, a gland that releases chemicals important for the body's growth and metabolism. This secretion of active hormones may cause pituitary gigantism (an excessive secretion of the growth hormone that occurs in childhood before the closure of the bone growth plates, resulting in the overgrowth of the long bones) or acromegaly (a chronic metabolic disorder that results in gradual enlargement of tissues including the bones of the face, jaw, hands, feet, and skull) before they are detected. Individuals with craniopharyngiomas may also suffer from headaches and visual changes. Treatment for these tumours usually includes surgery and, in some patients, radiation therapy. These rare, benign tumours arise from the ganglia-type cells, which are groups of nerve cells. Gangliocytomas (sometimes called ganglioneuromas) are tumours of mature ganglion cells. The other type, gangliogllioma is a tumour of both mature nerve and supportive cells. Tumours of this type occur most frequently in younger people. They represent 0.4% of all primary brain tumours, and about 4% of all paediatric brain tumours. The most common sites are the temporal lobe and the 3rd ventricle, although they can occur in the spine. Cysts may form as a consequence, and seisures are the most common symptom. These tumours are small, slow growing, and have very distinct margins. It is rare for ganglicytomas to metastasise (spread). These tumours are very rare, slow growing and benign. They invade the temporal bone. It is the most common tumour of the middle ear. The location of the tumour is in the jugulare foramen at the base of the skull. This gives rise to symptoms that include hoarseness, difficulty swallowing, pulsatile tinnitus; conductive hearing loss; lower cranial nerve palsies; sensori-neural hearing loss and vertigo (late); headache (raised intracranial pressure). This benign, tumour like mass arises from blood vessels and is often cystic. Single or multiple tumours may be present. Hemangioblastomas represent about 2% of all primary brain tumours. Linau disease or Hippel-Lindau disease is an inherited condition which predisposes to this tumour and kidney cancer. 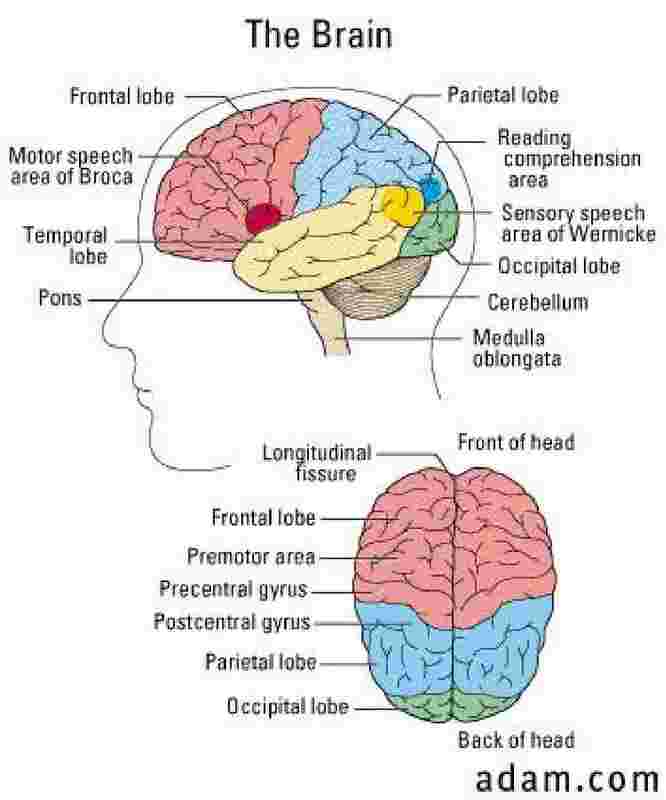 The most common site is the cerebellum. It is slow growing and does not spread. Symptoms include headache, nausea and vomiting, all attributed to an increase in intracranial pressure. Lipomas are rare, benign tumours composed of fat tissue. The most common location is in the corpus callosum but they also occur elsewhere. The most common symptom is seizures. The meningiomas arise from the "leptomeninges" (lining cells on the outer surface of the brain) or from the "dura mater" (fibrous covering of the brain). The dura is composed of two layers, an outer periosteal (next to bone) layer and an inner layer of dural "border cells." It is widely accepted that the meningiomas arise from the arachnoid "cap cells" and may therefore arise anywhere these cells are located, particularly near the "arachnoid villi" (cells near superior sagittal sinus (large vein at top of brain)). The meningiomas may be benign or malignant, or in between (atypical). The majority of meningiomas are benign. The benign meningiomas have many histologic subtypes. These include fibrous, transitional, angiomatous and syncytial meningiomas; many other subtypes of meningioma have been described as well. For these subtypes of the benign meningiomas there is no difference in recurrence rates or success of treatments for surgery or radiotherapy. The diagnosis of meningioma is made by both the neurological examination and the MRI. The meningiomas brightly enhance (take up gadolinium) and are easily discerned on the MRI. Parasagittal meningiomas arise from arachnoid villi of the superior sagittal sinus. Parasagittal meningiomas grow laterally and downward, displacing but not invading the brain. Forty to 50 per cent of parasagittal meningiomas invade the sinus and 25 per cent are bilateral. The clinical presentation depends on the location. For the frontal location, headache may be present for years, followed by slowly progressive personality change or dementia, apathy, flattened affect and occasionally difficulty walking (ataxia) and urinary incontinence. Seizures can be seen in 25 to 50 per cent of patients having parasagittal meningiomas. The parasagittal meningiomas can become large before diagnosis. The most common locations for the convexity meningiomas are just off the midline under the curved portion of the skull. The clinical presentation depends on the location: personality change and dementia for frontal meningiomas, sensory seizures or "receptive" aphasia (can speak, but cannot understand words) for parietal meningiomas. The sphenoid meningiomas are clinoidal, alar and pterional (inner, middle and outer) and each has a different presentation. The inner or medial sphenoid wing meningioma can present with visual loss over several years and optic atrophy on examination. There may be unilateral eye pain. Olfactory groove meningiomas arise over the "lamina cribrosa" of the "ethmoid bone," approximately 2 cm in front of the pituitary gland. The clinical presentation can be subtle and include anosmia (can't smell), euphoria or inability to concentrate. Seizures can occur in approximately 30 per cent of patients. These meningiomas arise from the meninges of the anterior clinoid or tuberculum sellae about 1 cm posterior to the olfactory meningiomas. They can push on the optic chiasm and result in loss of vision. Cerebellopontine Angle meningiomas are 30 to 50 per cent of all posterior fossa meningiomas and can arise anywhere on the posterior surface of the petrous bone. The majority of cerebellopontine meningiomas arise in front of the internal auditory canal. The major symptoms of cerebellopontine angle meningiomas are hearing loss, vertigo, tinnitus (ringing), facial numbness and pain, and headache. Patients with cavernous sinus meningiomas can complain of pain behind the eye. Patients may develop protrusion of the eye or loss of visual acuity. There can be impairment of the cranial nerves that allow movement of the eye, resulting in double vision. The primary treatment is surgery for meningiomas that are superficial (near surface of the brain) or radiosurgery for tumours that are difficult to reach (e.g. cavernous sinus) without high risk to the patient. The decision to operate on the meningioma depends upon the nature, magnitude and pace of the symptoms, as well as the size and location of the meningioma. Surgery alone can result in cure or prolonged "disease-free" survival. If the tumour is not completely removed, however, the likelihood of recurrence of the meningioma is high. For such cases postoperative radiotherapy or radiosurgery may be recommended. Fractionation of the radiosurgery for meningioma often results in higher sparing of the surrounding normal tissues. These tumours are from the arachnoid cells of the meninges (at the back of the brain) and spinal chord. They represent about 20% of all primary brain tumours. Although the majority of meningiomas are benign, they can recur, sometimes as a higher grade tumour. Frequent sites are parasagittal region, the posterior fossa, the cerebellopontine angle and the base of the skull. The benign meningioma is slow growing with distinct borders. Therefore, it can grow to quite a large size before the symptoms become apparent. Symptoms are because of increase pressure on the brain. The atypical meningioma has a middle range of behaviour. These tumours are not clearly malignant, but they invade and spread within the brain, are fast growing and can recur. There are other malignant forms of this tumours, giving similar symptoms. This rare, grade 1, benign tumour occurs in a lateral ventricle in the region of the foramen of Monro, and occasionally extends into the 3rd ventricle as well. Common symptoms are those associated with an increase in intercranial pressure -headache, nausea, vomiting, drowsiness, vision problems. Neurofibromatosis (NF) is an inheritable disorder characterised by benign (non-cancerous) 'lumps' or tumours, which form in and around nerves in various parts of the body, particularly the skin. NF is caused by a faulty gene, and the children of a person with NF each have a 50 per cent chance of inheriting the disorder. However, the disorder can sometimes occur when there is no family history, due to a spontaneous gene mutation. Neurofibromatosis Type 1 (NF1) - also known as von Recklinghausen's disease. Neurofibromatosis Type 2 (NF2) - also known as bilateral acoustic neurofibromatosis. Around five per cent of people with NF have neurofibromatosis Type 2 (NF2). It is estimated that about 1 in 40,000 people are affected. It is distinguished by the development of benign (non-malignant) tumours on one or both auditory (hearing) nerves, specifically the eighth cranial nerve that services the ears. These tumours are called acoustic neuromas. Benign (non-malignant) tumours may also occur on the spinal cord. Other tumours of the central nervous system may also develop - for example, neurofibromas, meningiomas, gliomas and schwannomas. Other nerves of the face may be affected, leading to symptoms such as difficulties with swallowing, chewing or moving the eyes. Adolescence is usually when symptoms first show up. The disorder may be asymptomatic (show no symptoms) until the person is aged in their 40s or 50s. Cloudiness on the lenses of the eyes (posterior capsular cataracts) at a younger age than would otherwise be expected. Symptoms of cataracts may include impaired vision and, in some cases, the progressive loss of vision. People with NF2 generally have fewer brown spots (cafe-au-lait) on the skin than those who have NF1. Other neurological problems may also develop, including headaches and seizures. Pituitary Adenomas arise from the cells of the pituitary gland and can include the prolactin producing cells, the ACTH producing cells, the growth hormone producing cells, and others. Frequently the cells that form the tumour do not make any hormone (nonfunctional pituitary adenoma). Hormonal overproduction due to functional cells in the tumour is common. The most common functional pituitary tumour is the prolactinoma. Visual change due to pressure on the optic nerve is possible. Frequently the pituitary tumours result in "bitemporal hemianopsia" (loss of peripheral vision on both sides). The primary treatment is surgery. In some cases radiotherapy or radiosurgery may be the initial treatment. For recurrences the radiation or radiosurgery are useful options. Pituitary adenomas are slow growing, benign tumours of the pituitary gland. They represent about 15% of all primary brain tumours. Most pituitary adenomas grow within the front 2/3rds of the pituitary, called the adenohypophysis. The most common symptoms are present when the tumour invades the optic chiasm, causing headaches and visual loss. These tumours are classified as secreting or non-secreting. The majority are secreting, and are further classified by the nature of the hormone secreted. Because these affected other parts of the body, treatment often involves many different specialists. A hormone specialist is called an endocrinologist. The mature teratoma is a rare, benign germ cell tumour. Teratomas represent 18-20% of all germ cell tumours and contain calcification (mineral deposits) and cysts. Tumours such as these tend to spread via the cerebrospinal fluid. Teratoma symptoms include diabetes, vision changes, headache and symptoms of increased pressure on the brain. These rare, noncancerous tumours arise from the blood vessels of the brain and the spinal cord. The most common vascular tumour is the hemangioblastoma, which is linked, in a small number of people to a genetic disorder called von Hippel-Lindau disease. Hemangioblastomas do not usually spread. Surgery is curative. A screening evaluation is recommended to rule out renal cancer, adrenal tumours and retinal abnormalities.